Lakebay is a small, unincorporated community on a southern branch of the Kitsap Peninsula known as Key Peninsula. Lakebay is located on Carr Inlet and Bay Lake in the Puget Sound and is a part of Pierce County. It is adjacent to the Penrose Point State Park, a 165-acre waterfront park with a wide variety of activities available. 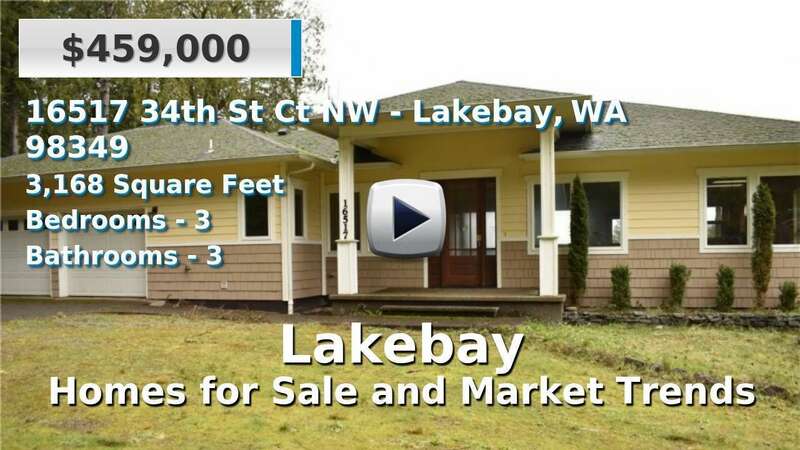 Homes for sale in Lakebay are quite rural and, not surprisingly, a good number have waterfront views. Neighbors include Vaughn, Longbranch, Anderson and McNeil Islands. 2 Beds | 1 Baths | 1002 sq. Ft.
3 Beds | 1.75 Baths | 1437 sq. Ft.
4 Beds | 3.5 Baths | 3667 sq. Ft.
4 Beds | 2 Baths | 1404 sq. Ft.
3 Beds | 2 Baths | 1715 sq. Ft.
3 Beds | 2 Baths | 1340 sq. Ft.
2 Beds | 2 Baths | 1788 sq. Ft.
8 Beds | 7071 sq. Ft.